Sparked by an interest in the writer Marianne Fritz (1948-2007), the artist conducted a period of research on her, visiting her apartment and archive, and followed a trajectory of ideas that surround her work. 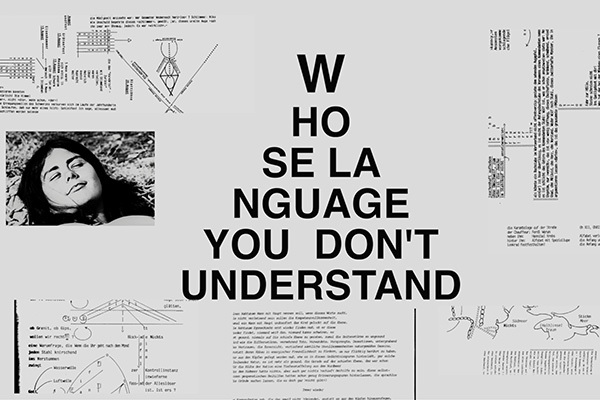 The result is Whose Language You Don’t Understand, a video cycle named after the novel by Fritz. This evening will present all twelve sections, one for each of the volumes of Fritz’s book. These sections are told from the perspective of each member of a team working on a dense, difficult and mysterious project. Each section confronts the philosophical and practical limitations involved in telling a history. In addition to the twelve sections, the artists will also present a new performance section that continues the process on the project since the videos completion combining videos, images, and text. Kim Kielhofner is an artist known for her layered videos, both visually and narratively. She completed her education at Central Saint Martins College of Art and Design (MA, London, UK) and Concordia University (BFA, Montreal, Qc). Her work has been shown in numerous international festivals and she has participated in residencies. Her solo exhibitions include VOX, centre de l'image (Montreal, 2015), LUX (London, 2017), and Dazibao (Montreal, 2017). Her videos are distributed by Groupe Intervention Vidéo. The research for this project was done in 2017 on a residence from KulturKontakt supported by The Austrian Federal Chancellery. Dank an: cyberlab, Brillenmanufaktur, shu!